How to update Moto Z2 Play to Android 8.0 Oreo? Leave a Comment on How to update Moto Z2 Play to Android 8.0 Oreo? Motorola, which is now acquired by Lenovo, has stepped up their Android update program. The manufacturer started rolling out Beta software update for many of its smartphones for quite some time now; often known as Motorola’s SOAK tests. Today, Motorola has released official stable Android 8.0 Oreo for the Moto Z2 Play and all of its variants. So you can either go to Settings > About Phone > Software Update and check for any OTA update availability, or you can simply download the full factory image from below and flash it using Fastboot method. The new Oreo update for Moto Z2 comes with a new firmware build number OPS27.76-12-15. 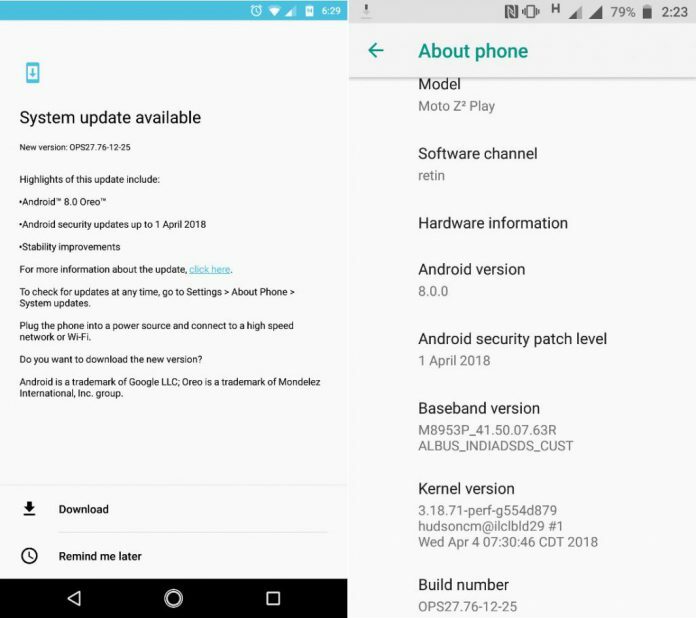 It also features April 2018 Android Security Patch. You will also find some stability improvements to the system, battery life, and performance as well. The OTA update weighs 1190 MB (approx. 1.2 GB) in size and is currently rolling out in the USA, Europe, Australia, and some Asian countries as well. We have already seen Oreo for other Motorola devices such as Moto Z Play, Moto Z, Moto Z Force, and Moto X4. Here is Android 8.0 Oreo for the Moto Z2 Play. Oreo introduced us to features such as Auto fill APIs for username and passwords for websites and apps, Picture in Picture Display (PIP), Adaptive Icons, background limiting, support for High Quality Bluetooth audio codecs such as LDAC codec, Keyboard Navigation, updated Emojis, Notification Channels, and much more. We have managed to capture the Factory Image for the Moto Z2 Play and many of its variants. The firmware is basically for the Brazilian variant XT1710-07 Retail Albus. However, it can also be flashed onto other Moto Z2 variants from other countries such as, XT1710-01, XT1710-02, XT1710-06, XT1710-07, XT1710-09 and XT1710-10. Other variants need to be tested. Use it at your own risk. How to install factory image or stock firmware onto Motorola device? Make sure you have a Moto Z2 device with one of the listed variants. Although it is not necessary to Unlock the Bootloader on your Motorola device as it is the official Motorola firmware, but we still recommend to unlock the Bootlaoder just in case. So that it is easily recoverable. This method will perform a clean flash. So backup. If it does not, it is recommended to perform a factory reset after flashing. Step 1. Download and install the Motorola drivers to PC. Step 2. Download the Oreo factory image and extract the zip to PC. Step 3. Download the Fastboot Installer and ADB drivers as well. Extract the zip inside the folder where the Factory image was extracted. Step 4. Now, reboot your device into Fastboot Mode. To do so, turn off your phone completely. Then press and hold the volume down button and connect it to the USB port of the PC. You can also reboot into recovery and select Fastboot mode. Step 5. Now simply run the installer file by double clicking it on your PC. A command prompt or terminal window will open. Step 6. Follow the on screen instructions on the cmd screen. Step 7. Once done, restart to system. Alternatively, you can flash the firmware manually using this tutorial. Enjoy your new Oreo firmware!